Time is just flying in the summer arctic. Nothing too amazing going on in Longyearbyen. Somebody managed to park a car in a pond next to the road in Adventdalen. One is tempted to ask: why? I don’t know. Nobody was hurt, at least. Some tourists thought that huts in the wilderness are principally open for everybody. This is not the case. It took the police to get this message across in this given case. It also took the police to convince two female tourists that you have to leave the boat when the trip was over even if it did not meet your expectation. People in Longyearbyen don’t know if they should laugh or cry sometimes. In yet another case, the police found vertebra of marine mammals in some tourist’s luggage at the airport. Not good. One day, when MSC Meraglivivia was in the harbour, the number of peole in Longyearbyen tripled. Make sure you don’t end up on the wrong ship! 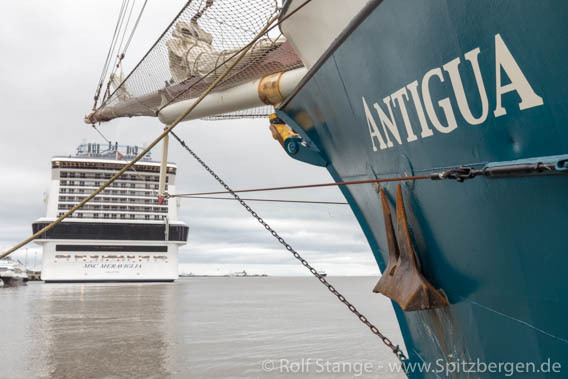 Soon we will take off with SV Antigua. Time to check a huge pile of equipment, sort stuff, repair some items, replace other ones. So time is flying as usual, and suddenly Antigua is in the harbour. An immense pile of equipment needs to be carried on board and then it is already time for take-off. Welcome on board and here we go! We are steaming against a breeze out of Isfjord and then turn into Forlandsund. Spitsbergen, here we come!